Reverend Willy's Guitar Picks reflect the style and voodoo of Billy Gibbons - an American musical treasure and guitar icon. 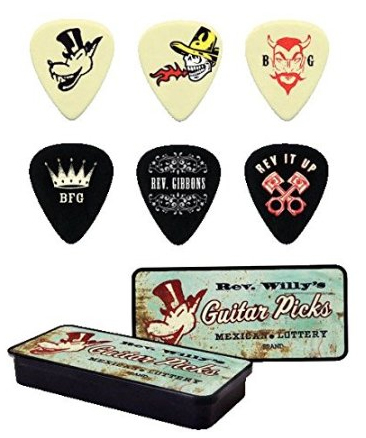 These picks feature Billy Gibbons inspired art which has been imprinted on authentic Dunlop picks and presented in highly stylized pick tins. Not only do they capture his "Texas boogie-blues rock style" perfectly but are true musical tools for the serious guitar player too.